Back in September, Sally Okun, Vice President of Advocacy, Policy and Patient Safety, and community moderator Molly Cotter, attended the FDA public meeting on Parkinson’s disease (PD) along with PatientsLikeMe member Gary (tupelo). Why did you want to be part of the FDA public meeting? On the day I was diagnosed, back in 2012, I spent a great deal of time reflecting on my life. I thought a lot about how Parkinson’s disease will impact me and my family in the future. On that day I made a commitment to myself that I was going to take control, to the best of my ability, on the course of the disease progression, and would do anything possible to find a cure. I was determined to educate myself as much as possible about the disease, put together the best possible health care team, learn all I could about treatments currently in research, and participate in clinical trials. Parkinson’s was a new challenge in my life and I intended to tackle it like I would any other challenge that I had faced in the past. Along the way in this new journey, I became more publicly involved as a PD advocate, both for advancing research as well as supporting newly diagnosed patients. So, when I noticed the FDA announcement regarding the meeting, I decided to send in my comments and thoughts in hope that they might be helpful, to whatever degree, in moving research along for better treatments. What did it mean to be accepted? When I submitted my comments I never expected to be asked to participate on one of the panels, nor was I intending to attend the meeting, which was on the eve of a religious holiday. I was quite surprised when I was contacted by the FDA, but was caught in a dilemma. Participation meant missing an important time with my family. However, when we discussed it, we all agreed that this was such a great opportunity, and honor, to be able to represent the needs of the millions of Parkinson’s disease patients worldwide to the FDA. There was no way I could turn down that kind of invitation. 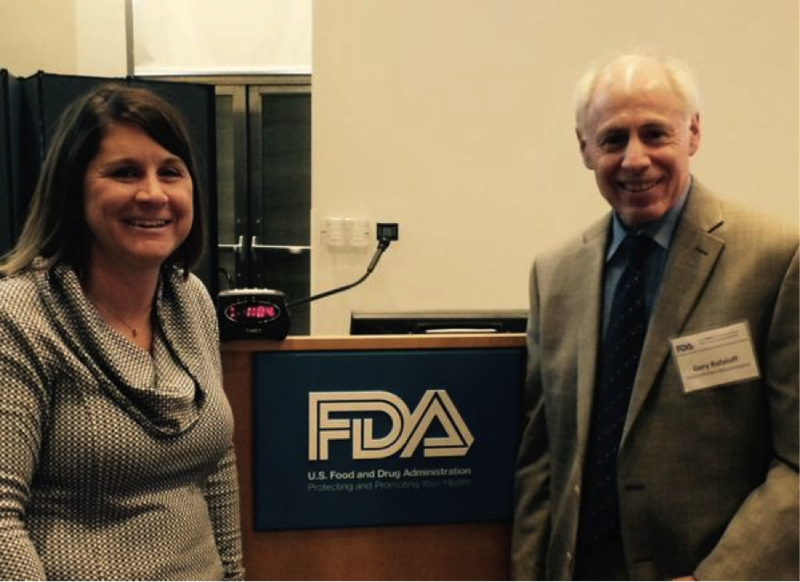 What was it like being there as a patient representative at the FDA event? Did you feel like your voice was heard? I’ve participated in a number of seminars and conferences in the past, so there wasn’t much difference with the arrangement for this meeting. If anything, it was much more low key. Nevertheless, I definitely had a sense of awe when I arrived at the FDA complex. There were multiple buildings all over the sprawling campus. It immediately reminded me of the importance of this event compared to others I’ve attended. We were going to be presenting to the Director of the FDA’s Division of Neurology Products and nine other senior staff members. This is about as high up as we could go in our advocacy to advance Parkinson’s disease research. During the meeting, it was difficult for me to tell how our presentations were going and whether they would have an impact on the FDA’s staff, although it appeared to me that they were listening intently. I was certainly concerned about the limited amount of time I had to speak. Several days later, though, I watched the webinar presentation of our event and I felt that we hit on the large majority of the most important areas of concern that our community has regarding current and new treatments. Only time will tell if the FDA will act accordingly with our hopes and suggestions. One small item that I noticed which suggests that they were listing involves a question on the Patient Questionnaire at the meeting. We were asked to choose from a list of Parkinson’s symptoms the ones that were most impactful on our lives. In my presentation, along with several of the other panel members, we noted that they didn’t include pain or orthostatic hypotension, two very common symptoms, on their list. I did, however, see that on the new follow-up survey the FDA is conducting, they have added both symptoms to the bottom of the list. So, at a minimum, they were listening as we spoke about these debilitating symptoms. Well, I can’t say that I learned much about the disease while I was there, but, of course, that wasn’t the purpose of the meeting. Our presentations were intended to educate the senior staff and decision makers of the FDA. That being said, what I did learn was the amazing dedication and effort that members of our Parkinson’s community will undertake in order to be heard at a forum. Members with severe difficulties traveled from all parts of our country in order to be able to speak for a few minutes. I was truly honored, and most definitely humbled, to be part of a panel with these dedicated individuals. If you haven’t yet seen the archived presentation of the meeting online, I suggest that you at least watch the members of the first panel speak to the FDA about their symptoms, it was amazing. What are your hopes for future research in Parkinson’s disease? We were asked by the FDA to limit our answers to their questions in the context outside of finding an actual cure. In addition, we were mainly directing our responses to the FDA’s role of controlling the approval and distribution of prescription drugs, more so than studying the potential impact of alternative therapies such as exercise, vitamins or other supplements, or the development of new medical devices to assist with symptomatic control (all of which are needed). So I’ll stay within that premise. I see the need for a three-direction approach for future research. First, we need to continue and expand research into the biological science of Parkinson’s disease, as well as other neurological diseases with similar developmental processes, such as Alzheimer’s and ALS. With a better understanding of the disease cause, pathways, and progression, we will have a much greater chance of finding better treatments and potential cures. Second, I would like to see research into the development of better symptomatic treatments. These treatments should be effective for multiple symptoms, have fewer disabling side effects, and have extended release and longer term activity. Although today’s treatments are somewhat effective treating motor impairment, they are greatly lacking in effectiveness for many other non-motor symptoms. Many of the drugs have side effects that can be more disabling than the symptoms they treat. In addition, it would be desirable for new treatments have ease of administration, such as oral, sublingual or inhalable as opposed to invasive surgery or device implantation. Third, and most importantly, we need research to discover interventional treatments that can slow or halt the disease progression, if not totally cure it. This research should target the development of new drugs and vaccines that can intercede along all of the numerous biological pathways as the disease progresses. For example, we would find means to either stop the misfolding of proteins, prevent proteins already misfolded from accumulating in brain cells, or eliminate misfolded proteins which have already accumulated and are leading to cell death. Finally, I would like to see more research in alternative treatments, such as stem cells and human growth factors, in addition to traditional drug development. It’s imperative that the FDA allow our scientists to be as innovative as possible as they attempt to find treatments and cures for the most complex illnesses we have in brain diseases. With new interventional disease modifying drugs, along with improved symptomatic treatments and a proper exercise regimen, most, if not all of us dealing with Parkinson’s disease would be able to live active and productive lives for many years beyond our diagnosis. For more information, check out the full video of Gary’s panel. And don’t forget to visit the site to connect with Gary and the more than 11,000 other PatientsLikeMe members living with Parkinson’s disease.